There’s been a lot of buzz lately about cooked or gelatinized verse raw maca. Some people don’t do well on raw maca. A common complaint is trouble with digestion. If that’s you, please try gelatinized maca. For more information on this and all you could ever want to know about this wonderful superfood, see my article on maca. Also, I purchase maca from Mountain Rose Herbs. Maca is a potent superfood and one I recommend cycling. I like to take it for 3 weeks straight, then take a week off. This cycling will further enhance the benefits and save you a little money. I cycle most superfoods, supplements, and food in some way shape or form. It’s good to take a break from most everything from time to time so your body doesn’t become so used to it that the benefits lapse. This recipe features one of my favorite herbs, Pau d’arco. It’s best known as a potent anti-fungal. This is good recipe for something battling a fungal condition such as candida. Use your preferred herbal tea if you don’t have Pau d’arco on hand. For more info on this herbal gem, check out this article. The brand of Pau d’arco I really like can be found on Amazon. If you’re new to maca I recommend starting with a teaspoon and working your way up to a tablespoon over the course of a week. Always wise to start small when incorporating new things into your diet. I included a bevy of add-ons for you take this recipe and truly make it your own. Enjoy! I’d love to know if you try this marvelous maca elixir or have benefited from maca – please leave a comment below. Happy Blending! Hi there. I have chia seeds and flax seeds. Is there anyway to make them blend better in the smoothie? They don’t seem to at all. I have a Ninja. Also, is there a way to turn flax seeds into flax powder? The Ninja doesn’t blend chia seeds, I’m surprised. With the chia seeds, soak them in water, 1 part chia to 1 part water, for 5-10 minutes and then try blending. That chia gel can be stored in the fridge and keeps for a month or so. You’ll need a food mill or more powerful blender to convert flax seeds into powder. You may want to purchase the powder in the future. Hi, Ryan. I want to try this smoothie soon, but have a question before I proceed. Is it advisable to use all add-ons in one single smoothie? For this smoothie or any other, that is. Great question. The add-ons are completely optional for every smoothie. I include them to provide ideas to bolster the nutrition and taste of your smoothies as well as to offer viable substitutes should you not have a particular ingredient(s) a recipe calls for. This is my first time trying maca. I made this elixir just as written, adding in the cayenne and coconut flakes. I am really struggling with the flavor of this one. Did you find maca to be an acquired taste? This smoothie wasn’t so marvelous, eh? You’re not the first person who’s found maca unpleasing to the palate. Honestly, I find it has a slightly nutty flavor and could eat it straight if it wasn’t so strong. Assuming you sourced a quality maca maybe the taste simply doesn’t agree with you. A full tablespoon is a lot (I’m going to modify the recipe and recommend starting with a teaspoon if you’re new to maca), maybe try a teaspoon in your next elixir or smoothie. Yes, I bought Navitas organic maca. I will try using just a teaspoon next time. However, it may take a while before I gain the moxie to try it again! How are you doing, hoping all is well with you. I signed up to receive your smoothies. I have only tried one so far. It is so delicious. It is called the Awesome Aloe Vera smoothie. I tried it last week and loved it. Could you add more Aloe Vera recipes. I would appreciate it very much. I am drinking this elixer right now and it is fabulous! I did exchange the tea for coconut cocoa tea because that’s what I had on hand. Used vanilla, cayenne, coconut and some almonds for the add ons. I am loving your website and seem to have it permanently open on my Kindle! Thanks for all of the work you put into it. That’s music to my ears :) Great to hear you’re making your very own elixir concoctions! You’re welcome – sharing and spreading this information is a joy. Can i put Pau d’ Arco powder into my green smoothies just as it is? 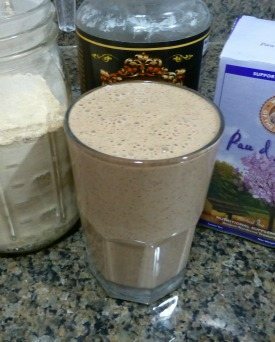 Yes, you can add Pau D’Arco powder into your smoothies and elixirs, Jabs.